One of my favorite parts of the holidays this year was decorating my little Christmas tree with English themed ornaments. 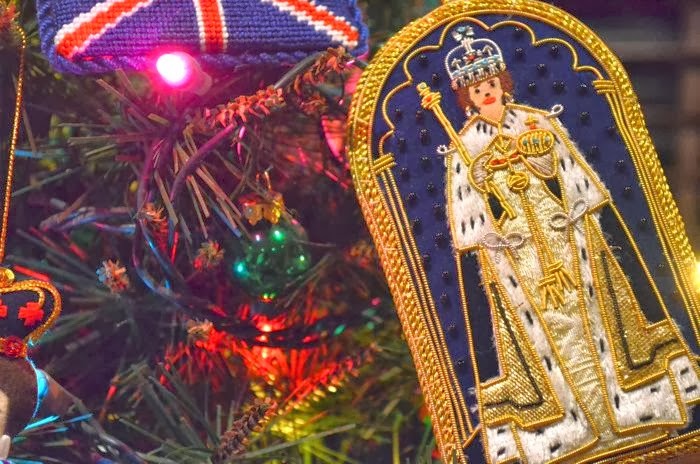 In England, the St. Nicolas company creates handmade, embroidered felt ornaments that are of historic people and places. 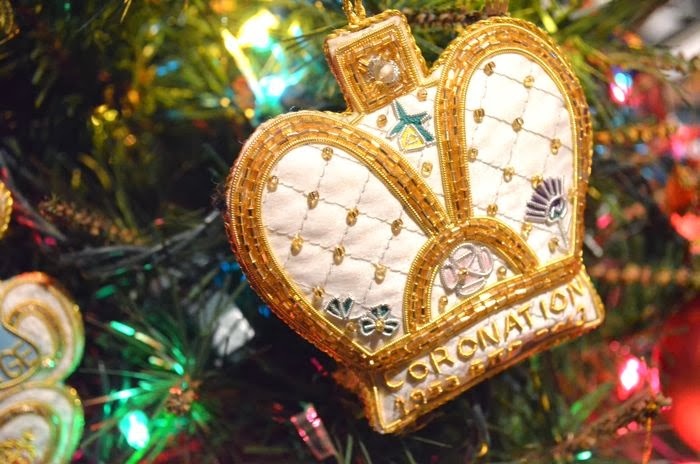 Most of the ornaments I collected from various palace and cathedral gift shops throughout London were made by the St. Nicolas company, and one of the ornaments was a gift! 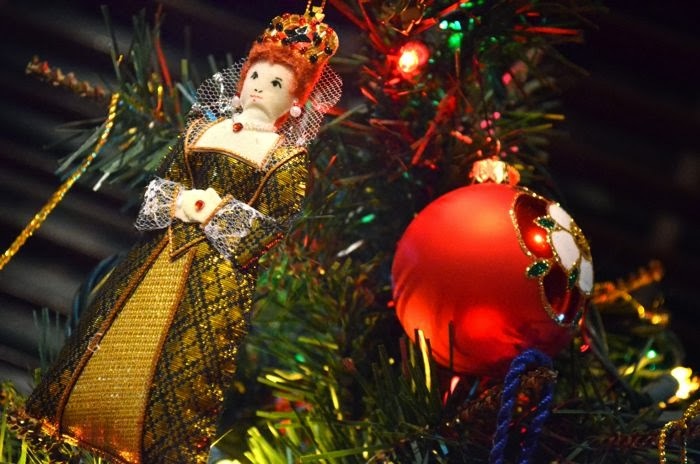 The three ornaments below are of three British Queens who were Queens in their own right -- Queen Elizabeth I, Queen Victoria, and Queen Elizabeth II. I had to look high and low for the Queen Elizabeth I ornament above, and I finally found one in the National Portrait Gallery gift shop. I love the fire red hair! 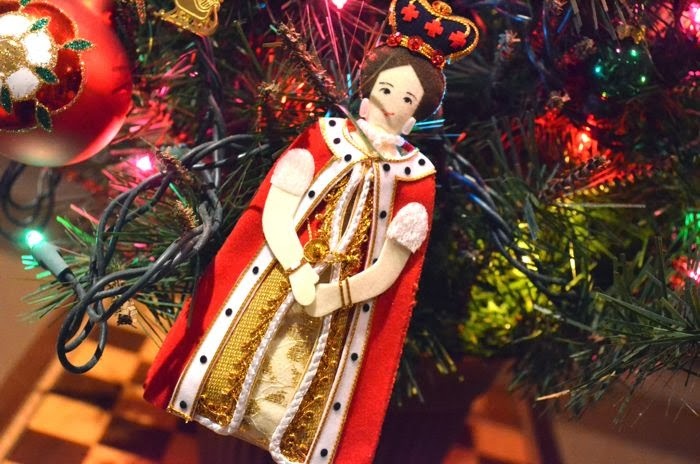 There are about four iterations of the Queen Victoria ornament -- a couple when she was a princess, one when she was an older Queen with enormous royal garments, and then the one above when she is a young Queen. Queen Victoria still looms large over London, and so it was no surprise that there were so many Victoria ornament options. Above is Queen Elizabeth II on the day of her Coronation. I think this depiction is fantastic because it really captures the sumptuous robes and dress she wore on that day, and I love that she is holding the orb and sceptre. Above is a Tudor Rose ornament that I found at Hampton Court Palace. 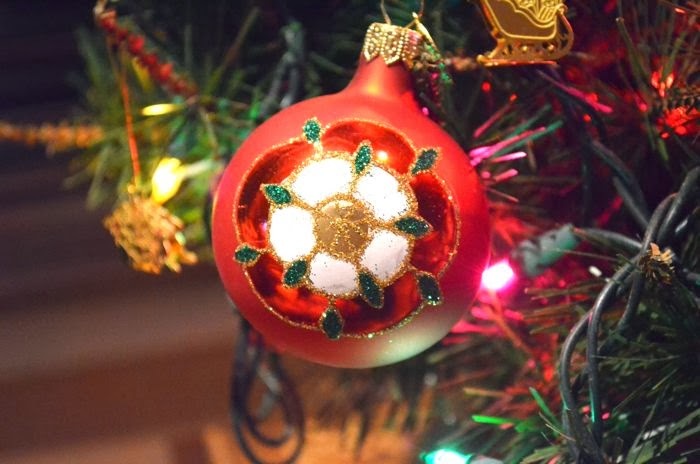 The Tudor Rose emblem was created following the end of the War of the Roses, when the House of Lancaster (red rose) and the House of York (white rose) united. I became positively obsessed with the War of Roses after watching the BBC miniseries "The White Queen," or as many of my friends know, after I became positively obsessed with the actor, Max Irons! The Queen's 60th anniversary of her Coronation occurred in 2013, and there were amazing events celebrating this anniversary throughout the year. I love the above ornament's depiction of the four countries that comprise Great Britain -- the daffodil for Wales, the rose for England, the thistle for Scotland and the shamrock for Northern Island. 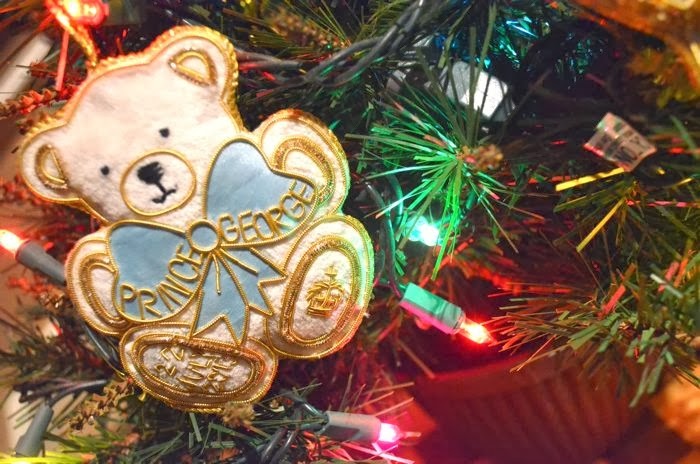 Prince George was born a couple of weeks after I arrived in London, and I thought it would be fun to get an ornament commemorating being in London during this fun time! 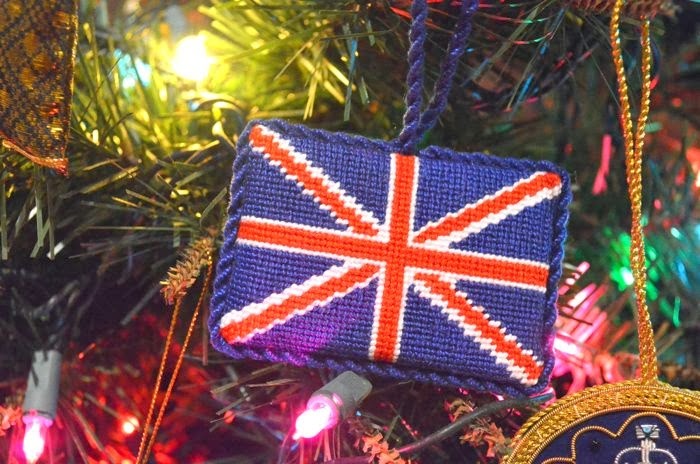 And finally, my best friend, Hilly, made me this great needlepoint ornament of a Union Jack. 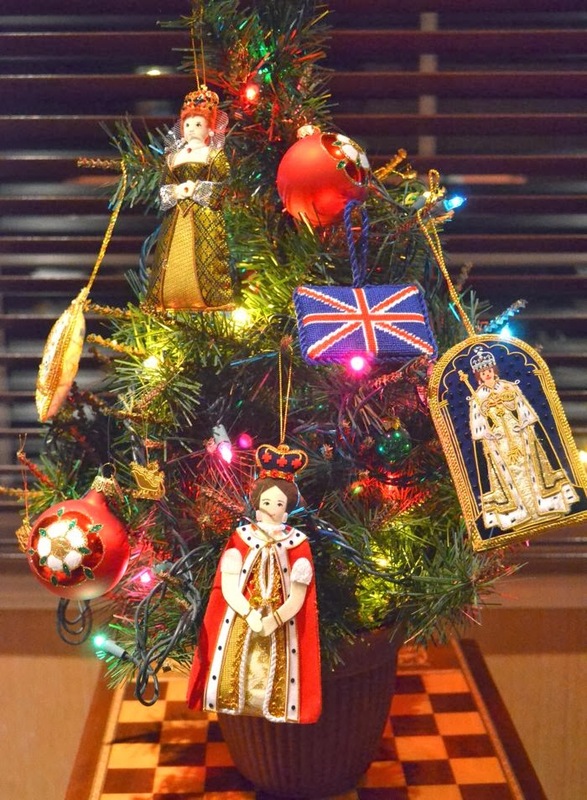 I adore it -- a perfect addition to my English themed Christmas tree. I can't wait to collect more English themed Christmas ornaments in the years to come!